Looking for a DUI Lawyer in Mesa means that you have been caught driving with alcohol in your system. Arizona has some of the most strict DUI Laws in the United States, and being pulled over for such a thing can have hefty penalties and legal repercussions. Arizona is a zero tolerance state which means that no matter your blood alcohol level, you will be charged with a DUI. The only difference is the type of DUI penalty you will be charged with. In Arizona, there are many different kinds, some worse than others. Here are the most common DUI charges in Arizona. The most common type of DUI penalty given is the First Offense Regular DUI. This offense calls for a mandatory minimum jail time of one day. It also includes finds and surcharges of around $2100 without the inclusion of jail costs from your one day stay. Your driver’s license will also be suspended for a minimum of 90 days and you will be required to install an ignition interlock device on your car for one year. Fortunately, a First Offense DUI is considered a misdemeanor in Arizona, and you will not be faced with criminal charges. You may be required to perform community service, or the judge may order alcohol screenings. This is the least brutal of charges you will be faced with when being caught driving under the influence of alcohol. The next charge you might be faced with is a Second Offense Regular DUI within seven years. With this offense, you will be faced with a mandatory minimum jail time of thirty days and will have to pay fines of over $2500 not including jail costs. From there, it is relatively the same as a first offense regular DUI in that your license will be suspended for a period of 90 days and you will have to have an interlock device installed in your vehicle for a period of one year. Again, the judge could be in charge of making you perform community service or possibly order alcohol screenings. The next kind of DUI Penalty is much more severe than the previous two. If you have a blood alcohol level of over .15%, this will lead to Extreme DUI charges. A First Extreme DUI Charge will lead to similar penalties of the Second Offense Regular DUI charges. You will have to face thirty days of jail time and will be forced to pay $2500 in fines. Your driver’s license will be suspended for 90 days and you will also have to have an ignition interlock device installed on your vehicle for a minimum of one year. More inconveniently, the person will sometimes have to submit to regular alcohol screenings and wear an alcohol monitoring bracelet around their ankle. A second Extreme DUI conviction happens within seven years of the first Extreme DUI Charge. Being charged with this will lead to 120 days of jail time and fees and fines of over $2500 which does not include jail costs. You will also lose your license for a year and you will have to have an interlock device installed in your vehicle for a minimum of 18 months. These are serious penalties that can be avoided if you do not drink and drive. More severe convictions start off with the First Super Extreme DUI. If your BAC is over .20%, then you will be faced with 45 days in prison and will have to pay fines and surcharges of $2500 not including jail fees. You will also lose your license for a period of 90 days and will be forced to install an interlock device on your vehicle for a minimum of 18 months. These are severe criminal charges. The last of the most common DUI charges that you may encounter in Arizona is the Second Super Extreme DUI. This happens within seven years of any DUI conviction, and you will have to spend a minimum of six months in jail. You will also be forced to pay over $2500 in fees, costs, and fines that do not include jail costs. Your driver’s license will be suspended for one year and you will have to have an ignition interlock device installed on your car for a minimum of two years. Seeing the penalties for each of these convictions should be enough for you to steer clear of driving under the influence of alcohol. But, if you are in need of an attorney in Mesa, then come to My AZ Lawyers, where we can help reduce or absolve your sentence. With our expert legal assistance, you won’t have to worry about those DUI Charges any longer. Contact us for more information. The Different Types of DUI Charges in Tucson and How They Interact! Be Smart! 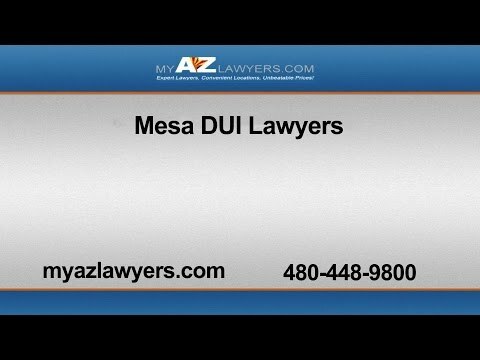 – Don’t Fall for these Common Mesa DUI Myths!